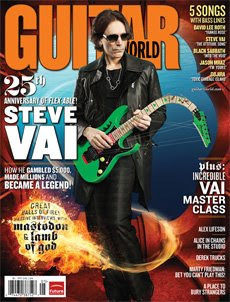 The May 2009 issue of Guitar World (on newstands March 10) features Steve on the cover and an in-depth article celebrating the 25th anniversary of Steve’s first solo album, Flex-Able. Steve recounts the production of the album, and the article includes many rare photographs of Steve’s self-built studio – Stucco Blue Studios – as well as photos from the sessions. You did WHAT to that beautiful guitar?! ?